Spectrum organizes a pride week dedicated to promoting and celebrating the LGBTQ+ community each spring. Pride Day usually is celebrated in June, which is Pride Month, but Spectrum selects a week within the spring semester so USD students can participate and support the LGBTQ+ community. The week will kick off on Thursday, April 18, with an LGBTQ+ Panel and the Masquerade Ball, which is a new addition to the Pride Week festivities. Mandie Weinandt, the advisor of Spectrum, said she is looking forward to hosting the new events included in Pride Week this year. 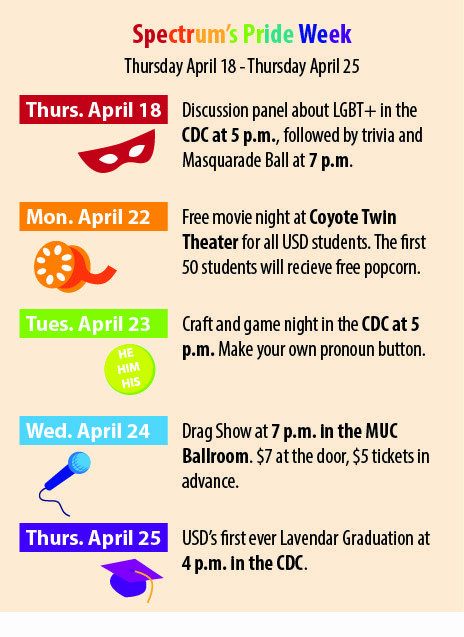 In addition to the Masquerade Ball, panel and drag show, Spectrum will also have a free movie night downtown and end the week with the Lavender Graduation, a special honoring of the USD graduates who are part of the LGBTQ+ community on campus. Jacob Holmberg, a sophomore criminal justice major, was just elected as Spectrum’s new president. He said he’s looking forward to working with both Spectrum and the RHA during Pride Week. In addition to unique events and activities, Pride Week also provides the opportunity for students to ask questions and learn more about the LGBTQ+ community. Holmberg also said Pride Week helps create a better environment for understanding and acceptance.